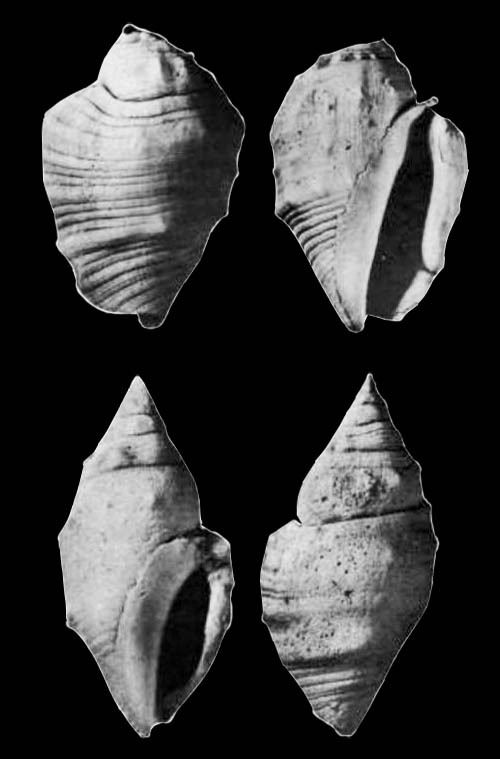 Original Description of Strombus (Lentigo) micklei by Ladd, 1972, p. 60: "Medium in size, spindle shaped, heavy; whorls about nine; protoconch smooth; suture excavated; outer lip thickened, smooth within; stromboid notch widely U-shaped; anterior canal short, straight; suture ascending near aperture; posterior canal short and narrow; inner lip smooth, callused. Sculpture consisting of several strong spiral ridges with low nodes; secondary spirals occur between the main ridges and both types bear fine tertiary spirals. Two specimens from Eniwetok drill hole F-1, depth 680-690 feet show traces of dark spiral bands of color on body whorl - a broad band on the shoulder, three narrower bands below." Locus typicus: "A dozen specimens, including the types, from core in drill hole 2A, Bikini, at depth of 925-935.5 feet. More than 50 fragmentary and immature specimens from drill holes E-1 and F-1 on Eniwetok at depths ranging from 640 to 750 feet." "This might belong to Conomurex or Gibberulus, or might be the ancestor of both"